I asked the women if they were satisfied with the way things were as far as the difference between the lives of men and women in their village. “Is everything okay the way it is” I asked. The women responded with “MATHI”, which in Nepali means “up” — “We want to go up”. More than half of the women at the meeting were alone because their husbands were working in another country. WELNepal is a newly formed charitable organization, but its founders have been raising money to support adult literacy classes in Nepal for the past thirteen years. WELNepal is currently funding 170 literacy classes, including 16 “Advanced Literacy Classes” and 54 Remedial Supplimentary courses plus numerous lectures on health, ecology and farming. Thus far we have educated, or are educating more than 5,000 women. We have only two or three million more women to go. WELNepal’s board members receive no salaries and pay for their own travel costs and living expenses while in Nepal. Less than 10 percent of the funds WELNepal collects is spent on administration. David worked for 25 years as a commercial photographer in Toronto. He left his profession in 1992 to see the world. Since his first visit to Nepal in 1996, David has had no desire to go anywhere else but Nepal, where he spends three months each year in the country’s lowland area. Since 1997 he has taught English conversation in Nepali government schools and helped to build village libraries. 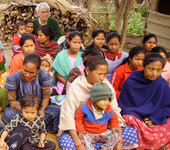 In 1999 he began raising funds for the education of Nepali adult women. Through his charitable organization he hopes to continue the work he has been doing in Nepal for many years to come. Barry is one of Canada's most prolific stage, film and television performers. He has been nominated for both Juno and Gemini awards and even has a gold record. He is the president emeritus of ACTRA Toronto, past president of the Actors' Fund of Canada and currently is serving on the board of the Performing Arts Lodge, Toronto. He has been an avid supporter of WELNepal for over ten years. He travelled to Nepal to witness their work first hand, creating the documentary film, "Sharmila In Her Own Words." Dr. Wendy O'Brien is Professor of Social and Political Philosophy/Humanities at Humber Institute of Technology and Advanced Learning. She also serves as the host of By-The-Lake Bookclub, a joint project between the City of Toronto and The Humber School for Writers, and is an active member in the Toronto literary community. A strong proponent of literacy and reading in her career and through her volunteer work, her desire to extend the possibilities that reading offers to others, led her to both sponsor a literacy class and later to join the Board of Directors of WELNepal. Harimaya Bandar, the woman on the right, is WELNepal's original coordinator. The woman beside her, Rabeeta Mahato, came on board to assist Harimaya when projects started to increase. In time, Harimaya married Raj, below her in the photo and along came Shreya. And Rabeeta found Santos Mahato and along came Prasancha. Both Harimaya and Rabeeta taught Raj and Santos how to work well with WELNepal. We expect things to stay this way for a while until Shreya and Prasancha can take over. Their organization is a registered NGO in Nepal.